Timber Wolf Snake River Hunter Fixed Blade Knife And Sheath - Stainless Steel Blade, Bone And Pakkawood Handle, Rosette Accents - Length 11” | BUDK.com - Knives & Swords At The Lowest Prices! When you’re out conquering the curves and bends of the river on that two-week canoeing trip that will test what you’re really made of, you need a survival knife you can completely rely on. 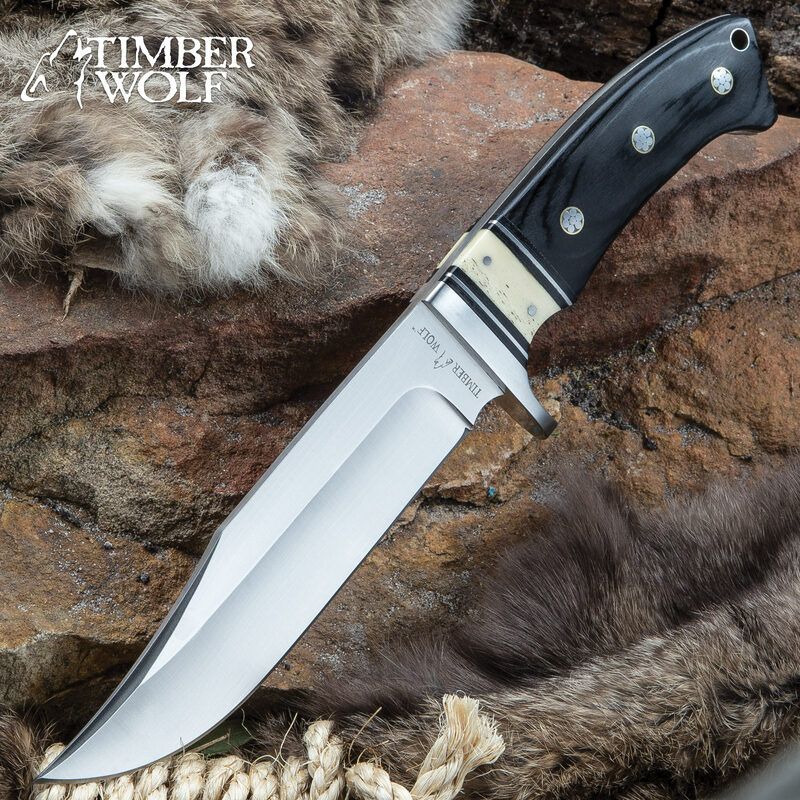 The Timber Wolf Snake River Hunter Knife is that survival necessity you need on your belt! It has a keenly sharp, 6” full tang stainless steel clip point blade that will slice through practically anything and a stainless steel partial guard to keep your hand from slipping to the blade even when the handle is wet. 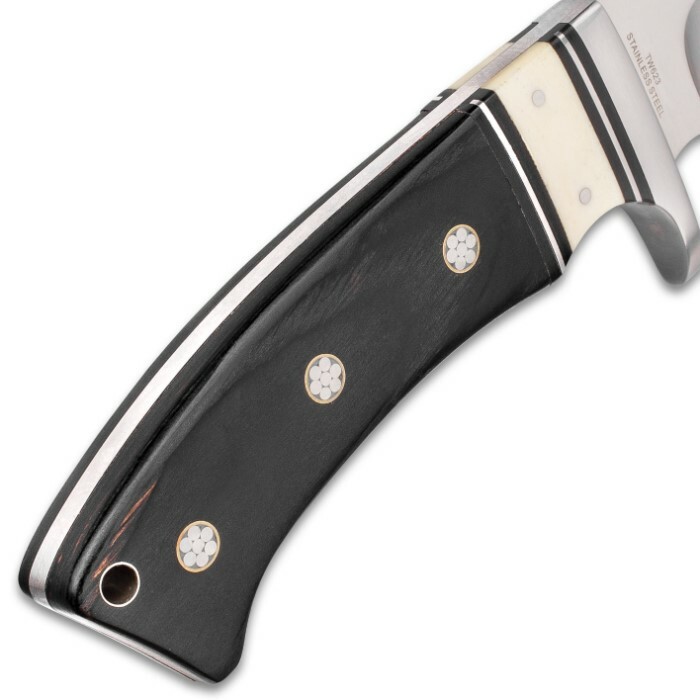 Black pakkawood and genuine bone handle scales are accented by silver rosettes on both sides of the handle and a lanyard hole offers another carry option. 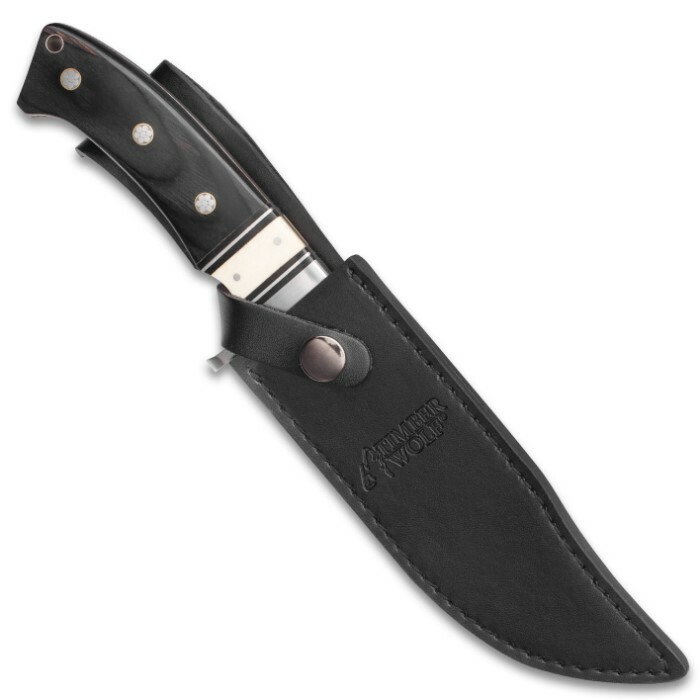 A premium, genuine leather belt sheath assures you the survival knife is just inches from your hand at any moment. I just recently became a Timber Wolf fan . I already own a couple of fine knives from these guys . 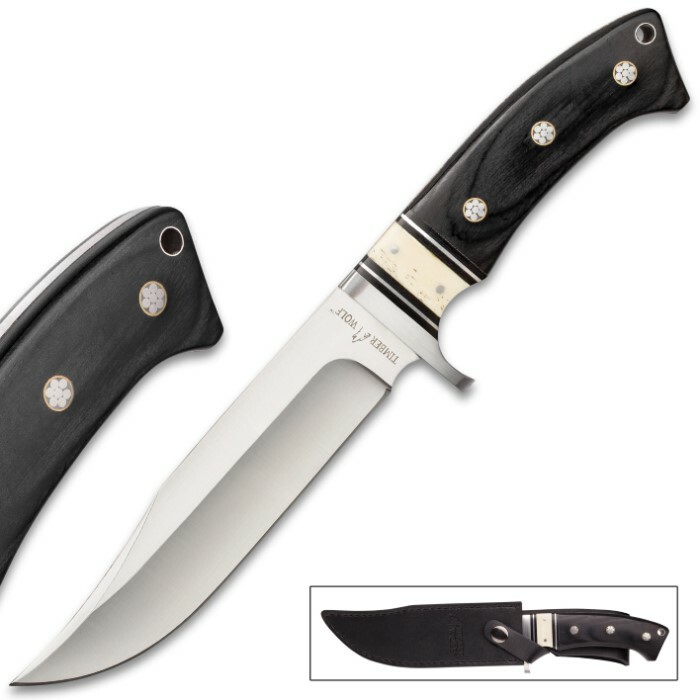 I gotta tell ya - don’t miss out on this Snake River Knife !! She is a real beauty !! Definitely could be sold in the $80 categories. Just be careful cause —— she bites !!!! Super sharp out of the box !! Thanks to folks at BUDK for that super nice packaging and speedy delivery. I am a fan of timber wolf knives but I'm always a little hesitant just because of the pricing. This one didn't disappoint at all. Beautiful, heavy thick stainless steel, and the handle was well finished with no rough edges to catch your hand that some cheaper knives tend to not worry about. Razor sharp, very happy!! Just received my Timber Wolf Snake River Hunter Fixed Blade Knife And Sheath this is a very nice piece came sharp out of the box handle is very comfortable finger guard is nice detail on the handle is awesome it would be a shame to get it nasty on something but o well. Wish it had a little bit of jibbing on top of the blade for your thumb sheath fits the knife well seems to be well made and usable only flaw was a little bit of a smudge on the blade that wont come off but I think I can live with that all in all good purchase.